Anyway, about these cute little tarts. 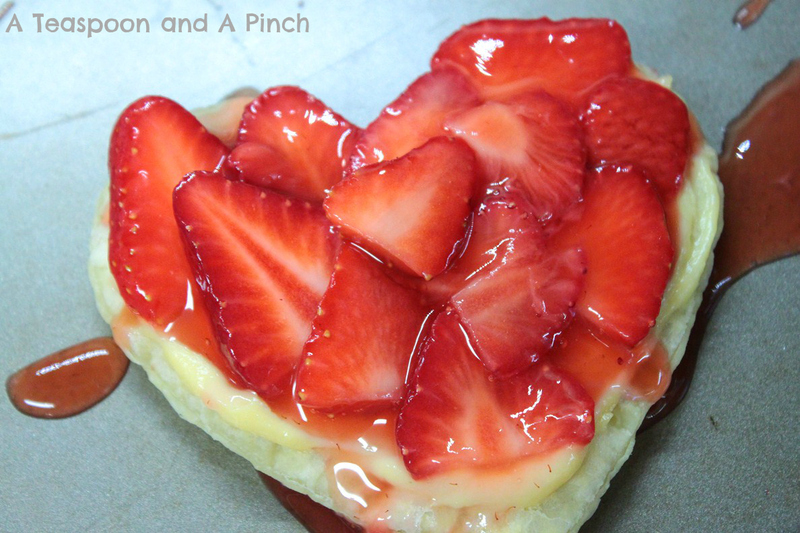 The pastry is light enough to not overpower, the cream is the perfect blend of vanilla and Amaretto, and the strawberry topping is perfect for dribbling on your face as you shove these right into your mouth. They're pretty, quick to make, and just fancy enough to be perfect for your Valentine. Thaw pastry dough at room temp for 40 minutes. Preheat oven to 400 degrees. Lightly grease a large cookie sheet. Place sheet of pastry dough onto a lightly floured surface. 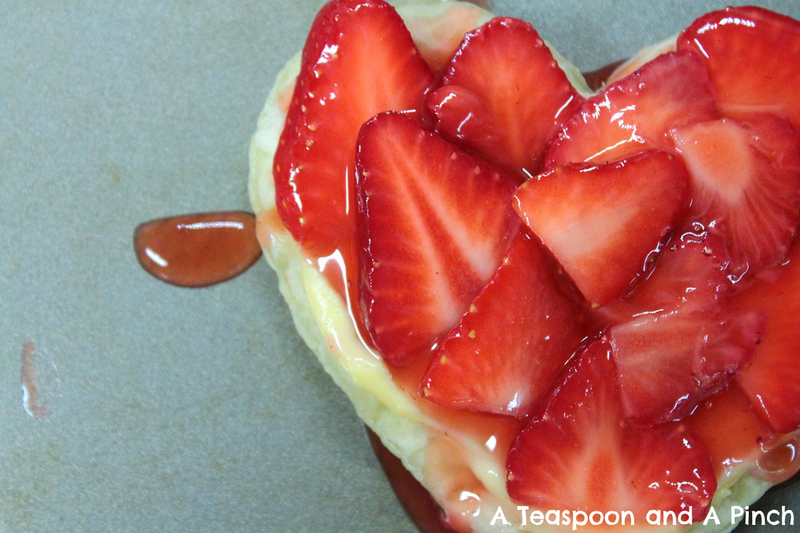 Cut with large heart cookie cutter (5") and prick each heart with a fork, to allow steam to vent. Place on cookie sheet and bake for 10-12 minutes, rotating halfway through, until golden. Allow to cool completely. In a medium saucepan, whisk together the sugar, cornstarch, and water. Bring to a boil over medium heat. Stir in the berries and return mixture to a boil, lightly mashing the berries to flavor the syrup. Remove from heat and set aside. In a medium-sized heatproof bowl, whisk the sugar and egg yolk together. (Do let the mixture sit too long or you will get pieces of egg forming.) Whisk the flour and cornstarch into the egg mixture, mixing until you get a smooth paste. Meanwhile, in a separate medium saucepan, bring the milk just to boiling (just until milk starts to foam up.) Remove from heat and drizzle slowly into egg mixture, while whisking constantly to prevent curdling. Then pour the egg mixture back into the saucepan and cook over medium heat until boiling, whisking constantly until it becomes thick. Remove from heat and immediately whisk in the vanilla and Amaretto. Use immediately or pour into a clean bowl and cover the surface with plastic wrap to prevent a crust from forming. Spread pastry cream onto each heart. 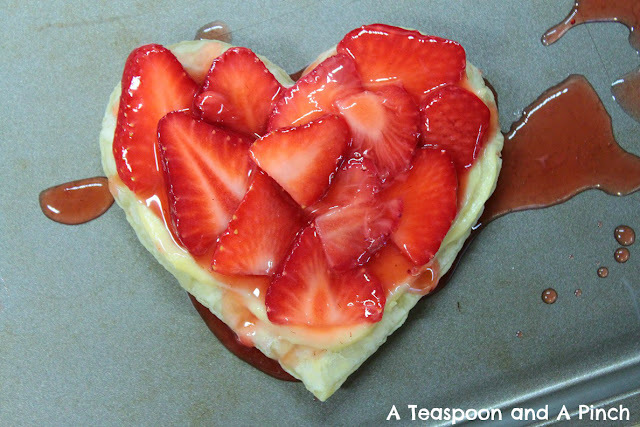 Then top with berry slices, arranging to lay flat and overlap toward the bottom of the heart shape. 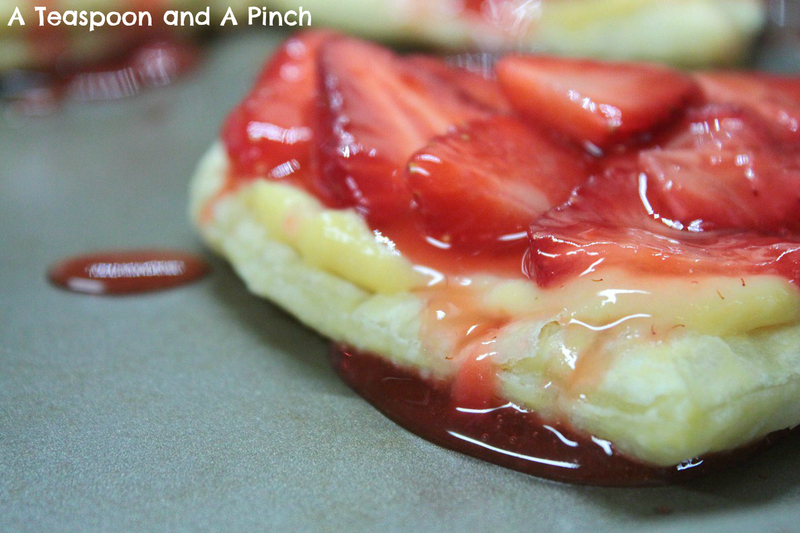 Drizzle on any remaining strawberry syrup and serve immediately. These are lovely Sara. Would make anyone's valentine very, very happy.